I assume this happens to many, but I seem to be notorious for forgetting about food photos I've taken with my phone. Alas! 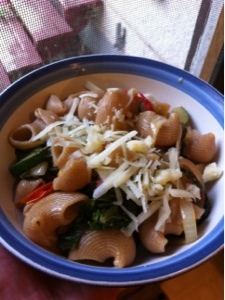 Here was Wednesday's dinner - whole-wheat pasta with olive oil, garden veggies, and local Asiago cheese ... wholesome, healthy, and delicious!